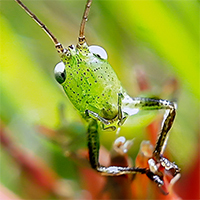 Macro photography is a trial even in the best weather. Add a little wind and a hand-held camera and it becomes a serious challenge! When shooting tiny objects, the key is to hold the camera very steady, so a tripod is the recommended way to work. Alas, I only had a GorillaPod SLR-Zoom with me and it wasn’t helpful, so I gave up using it. 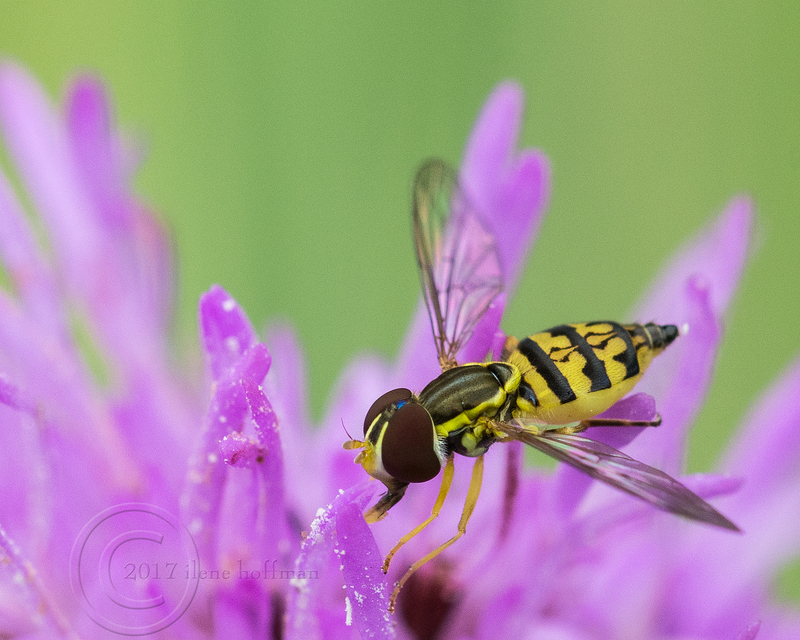 Here’s a Hover fly (Toxomerus geminatus), also known as a Flower fly or Syrphid fly, on some purple flower. This critter is less than half the size of a mosquito and rarely noticed zipping around your garden flowers. They can be very friendly and do not sting. I think I’ve identified this one correctly, but there are 870 species of hover flies that live in North America and 6,000 species worldwide! I love the pattern on its back and that tiny blue dot on its head. The first photo shows the little critter feeding on a flower. The second photo is zoomed in to show the eye detail. Don’t forget to click the photos to see a larger version. I will add more photos as I process them. Equipment used: Nikon D7100 and Sigma 105mm F2.8 EX DG OS HSM Macro Lens. 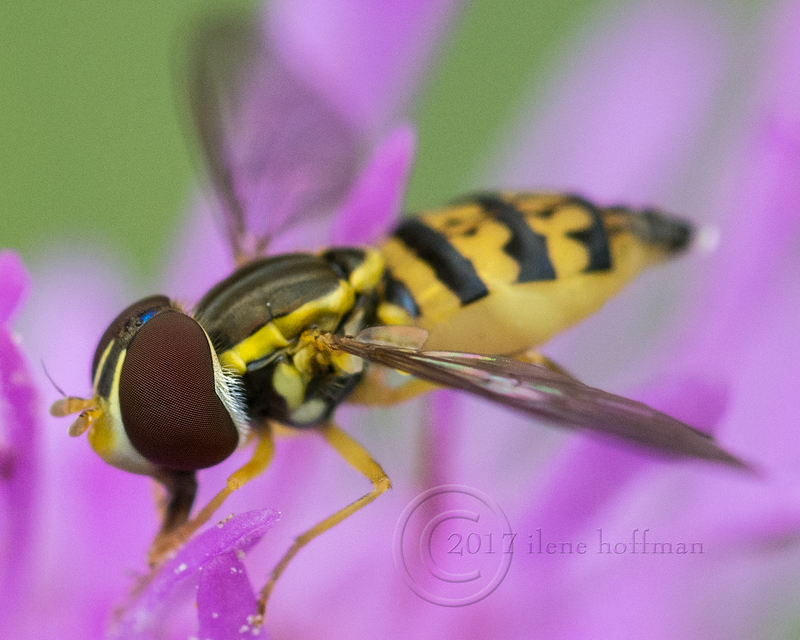 This entry was posted in Photo and tagged bugs, Diptera, flower fly, hover fly, hoverfly, insect, macro, macro photography, macrophotography, Nikon D7100, Photoshop CS6, Sigma, Sigma 105mm F2.8, Toxomerus geminatus. Bookmark the permalink. I would mistake that for a bee and go the other direction! nice shot!